Skiing through the forest on the 6km Gentianes run from Les Saisies to Crest Voland, it’s easy to forget you’re in a ski resort. 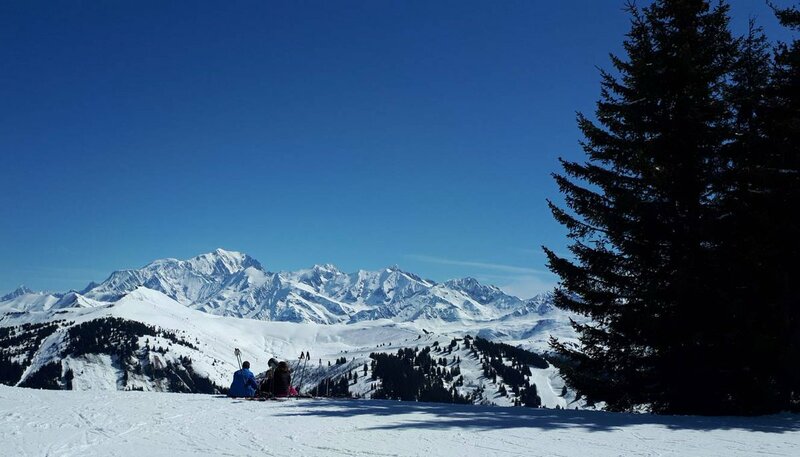 It’s this sense of taking your time that makes Les Saisies stand out as a family ski holiday destination. Neatly sandwiched between the Savoie and Haute Savoie, Les Saisies is just 40 minutes from Albertville and an hour from the Chamonix valley. While not well-known to British skiers, it’s been a popular choice with bien informé French families for years. “The Beaufortain region is known for its reliable snow record, which regularly sees it pick up more snow than in the Tarentaise and average 10m of snowfall each winter,” Barnasson told me. This may be more than just bluster, as I went to Courchevel immediately after this visit and Les Saisies clearly had substantially more snow at the same altitude than its more chichi neighbour. Even if the snow had not been as good as last season’s vintage, Les Saisies has snow cannons covering 40% of its 151 runs. The resort typically stays open to the end of April – much later than its neighbours, thanks in part to the grass that lies beneath the snow, rather than rocks, allowing the pistes to be groomed until much later in the season. Reliable snow and 70km of runs in the Les Saisies domain topped up to 192km across the full Espace Diamant area – which also includes the small Savoyard villages of Crest Voland, Notre Dame de Bellecombe, Flumet and Praz Sur Arly – means there’s plenty of skiing to be done all year round, and that skiing is perfect for families. While not as high as some ski areas, the Espace Diamant still offers a mix of slopes to suit all abilities. Even if you’re limited to green or blue runs, it is still possible to enjoy a circuit of all the photogenic peaks in the ski area taking in Mont Bisanne, Mont Lachat, the Chard du Beurre (known to our family as the ‘lump of butter’), and the highest point of the area, the Sommet de l’Espace Diamant (2069m) and then back to resort via La Légette (1865m) – where Olympic medallist Franck Piccard honed his racing skills – without going on a single red run. There’s a reason the strapline of the Espace Diamant is ‘Regard sur Le Mont Blanc’ (loosely translated as ‘Gaze upon Mont Blanc’) and the peaks in the circuit will give you all the best possible views of Europe’s highest peak that your Instagram account can handle. Nothing gets children excited about skiing more than a good instructor and our children were lucky enough to be in a small group of four in their lessons with ESF instructor Gilles Gontier. Not only did their skiing improve, but so did their repertoire of blagues, as Gilles had them cracking up with regular cheesy gags from a well-worn joke book stashed in his jacket. Gilles was typical of the more relaxed feeling that Les Saisies engenders, compared with some of the bigger resorts in France. There’s still plenty of non-ski activities to entertain after the lift close though. We stayed in CGH’s Hameau du Beaufortain, which has its own pool, sauna and gym, but if your children still have any energy left at the end of the day, then a visit to the glass-fronted Le Signal complex in the centre of resort, which houses a bowling alley and modern aquacentre and gym should finish them off! And if they’re thrill-seekers, then don’t miss the chance to try the Mountain Twister: a luge run mounted on rails that twists and turns down 800m up to 8m off the ground. It’s not all about speed though: Les Saisies is also known for its extensive cross-country ski area. The resort hosted all the Nordic ski events during the Albertville Winter Olympics in 1992 and has 120 kilometres of trails. It’s this mix of activities that makes Les Saisies an excellent choice for the increasing trend of 3G (Three Generation) ski holidays. “In January, we often see grandparents bringing their grandchildren to resort, while the parents stay at home to work,” Raphael told me. That didn’t surprise me at all: the magic carpets and beginners’ area are perfect for young children to learn and the older generation can enjoy 45km of signposted pedestrian trails and snowshoe itineraries. The development of Le Signal development is one way Les Saisies has modernised in the last few years. Plans are underway to upgrade the Légette chairlift to a six-man and relocate it so that it connects with the Carrets chair on the opposite side of the valley. This will make it quicker for parents to get into the lift system after dropping their children at ski school. 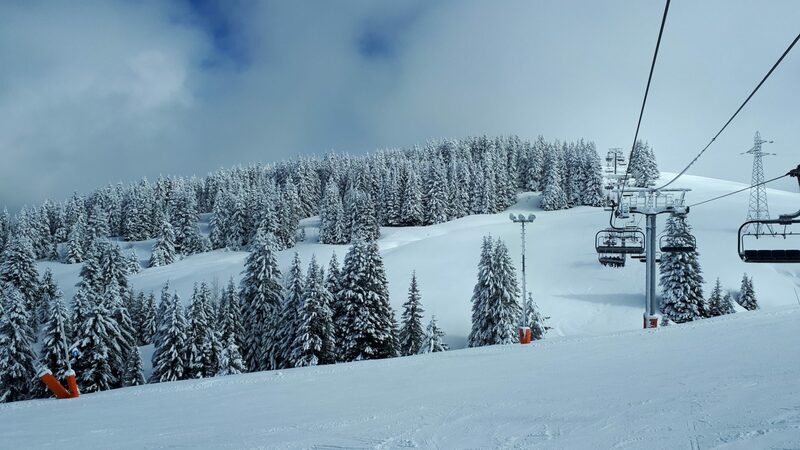 The Bellasta 6-seater chairlift was a completely new lift for the 2016/17 season and brought Hautluce Les Pres into the ski area for the first time. There was a secondary reason for its installation as its location means that Les Contamines and Les Saisies are now just one lift away from connecting. That said, a connection with the Megeve/Saint Gervais ski area has been long discussed. A single lift here would create a new combined ski area even larger than Les 3 Vallées. Somehow the designation ‘the world’s largest ski area’ doesn’t seem right for Les Saisies. It’s already large enough to sit in the list of ‘mid-sized’ ski areas. Frankly, although there’s room on the pistes for more skiers and snowboarders, it was a pleasure to enjoy this virtually empty resort. Les Saisies is not the resort for you if you’re looking for steep blacks and huge vertical, but it’s the perfect location for a family ski holiday. It’s a place you can all enjoy together and a refreshing change from the larger ‘industrial’ ski resorts that can sometimes make you feel you’re just a very small skiing cog in a very big skiing machine.